Oxenholme No. 1 Signal Box (officialy known as “No. 1 South”) was situated on the north-side of the Kendal to Kirkby Lonsdale road bridge in a raised position so that the line south of the bridge could be seen. It is understood to have had around 25 levers and controlled the entrance to the sidings on the down side. Signalman George Mattocks was on duty on 14 October 1920 when a derailment occured. John Gardner was a relief signalman who worked Oxenholme No. 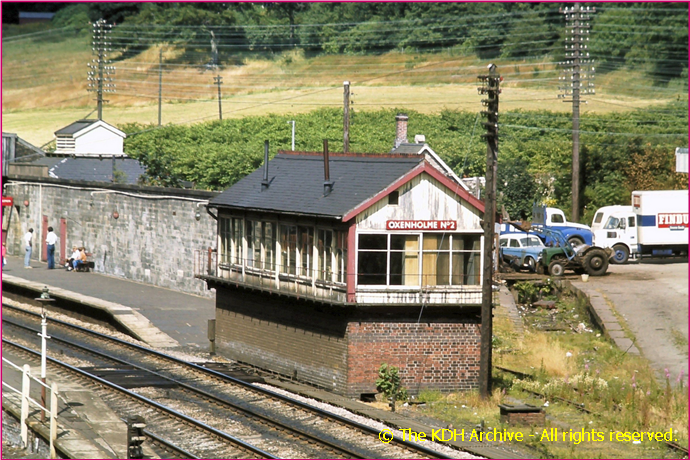 1 Signal Box before 1965, according to Adrian Vaughan, author of “Signalman’s Nightmare”. John Bateson advises us that Maurice Jellett, one of the last signalmen to work this box, accidentally emptied a pot of tea over the District Inspector. Before the days of tea bags it made quite a mess! The box was demolished in 1973. Signal Box 1 visible on left. Photo reproduced here with the kind permission of John A Bateson. After the original level crossing was removed and the road bridge was built, Oxenholme No. 2 Signal Box was situated on the south-side of the new Kendal to New Hutton road bridge on the down line side. It was in a raised position so that the station could be seen over the bridge. It was the biggest box of the three with around 60 levers. LNWR No. 2 Box towering above the Kendal to Old Hutton road bridge. Photo copyright of W L Harris. 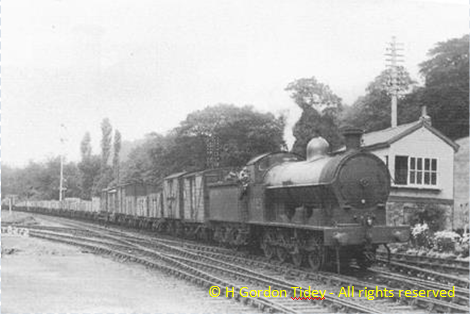 In 1943, LMS replaced the former LNWR Signal Boxes No. 2 & No. 3 with a new No. 2 Signal Box at the south-end of the up line platform. 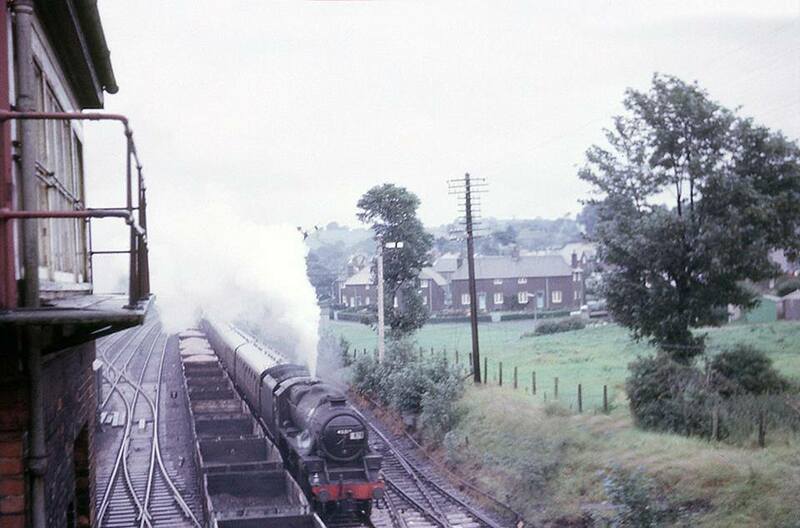 It is pictured below in August 1967. 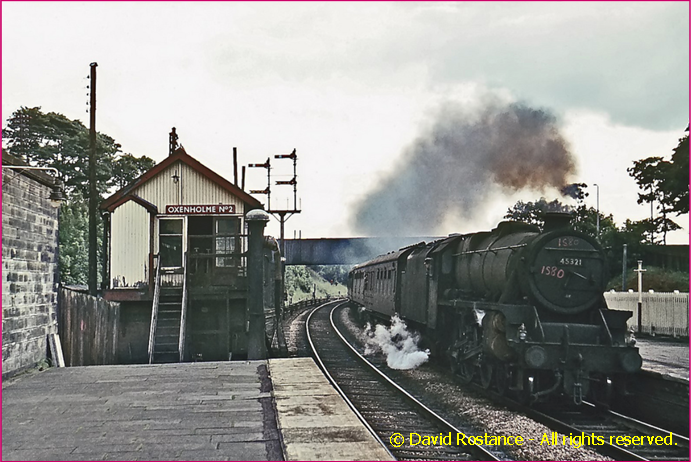 LMS Stanier Class 5 4-6-0 No. 45321 passes Oxenholme No. 2 Signal Box with the 13.20 SO Euston – Glasgow Central on 19 August 1967. Reproduced here with the kind permission of David Rostance. LMS Signal Box No. 2 was finally demolished in 1973. The LNWR No. 3 Signal Box (officially known as “No. 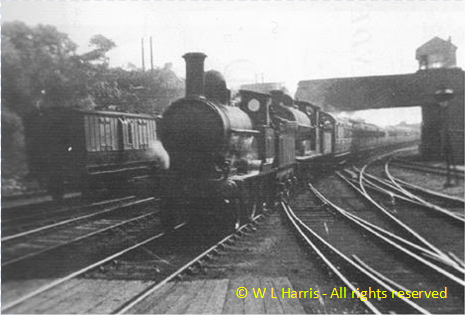 3 Junction”) was situated on the up line side overlooking the Windermere branch line junction. It was decommission in 1943. LMS No. 9023 passing No. 3 Box. Photo copyright of H Gordon Tidey.